Las Villas De San Buenas is the perfect, affordable, Costa Rica real estate development to kick back, relax and live the Costa Rican lifestyle of “Pura vida!” (pure life). Las Villas De San Buenas is 150 acres of beautiful Costa Rica real estate nestled in the foothills of the Osa Peninsula. Add a stream running through the middle, and almost 20 acres of primary jungle with hiking trails, and you can start to understand why we feel this is paradise. Daily sightings, and singing from, toucans and howler monkeys add to the natural ambiance found only in the Osa region of Costa Rica. Las Villas de San Buenas offers affordable Costa Rica home lots in a safe, beautiful and perfectly located development. Our property is not only a beautiful place, it is affordable. We take great pride in the fact that we have made owning a slice of paradise a reality. 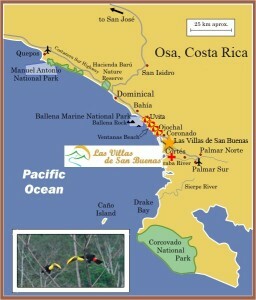 If you are looking for affordable Costa Rica Home lots, we are the place for you. Contact us today and set up a visit to our amazing property.